Violence is inseparably linked with dishonor and shame. To better understand these deadly partners, here are two learning resources—a book and a Missio Nexus webinar. A man only kills another when he is, as he sees it, fighting to save himself, his own self. … This is what I mean when I say that the degree of shame that a man needs to be experiencing in order to become homicidal is so intense and so painful that it threatens to overwhelm him and bring about the death of the self, cause him to loose his mind, his soul, or his sacred honor. 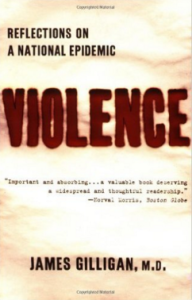 Overall, Gilligan’s Violence is a sobering yet thoughtful reflection worth reading, especially for people working with at-risk youth, prisoners, or other contexts of violence. It offers great insight as to how all levels of our society convert shame into violence. Missio Nexus will also be hosting a webinar “The Gospel of the Kingdom for a Violent World” by Werner Mischke on Feb 11, 2:00-3:15pm EST. Here is a summary: Honor-based violence makes the news daily. Yet the church is often weak in its understanding and response. Discover how the dark side of honor and shame fuels violence. Examine how Christ’s honor-sharing “gospel of the kingdom” offers a powerful cure for violence—a living hope and powerful message for the world today. Register here. I do not doubt the analysis, or the connection of shame and violence. But I believe it would be wrong to attribute all violence to shame. Well, I live in Mexico, and almost all violence I have seen (and I have seen a lot) was motivated by fear and the struggle for power, not shame and the plight for honor. Whether it were killings between drug cartels (show your greater power, induce fear), blood feuds between indigenous families, preemptive murder (kill your potential enemy to overcome your own fear and show your power), land wars, confrontations between police and protesters… It seems that honor is seldom (if ever) an issue here. Marc, thanks for more great cultural insights. Yes, I share your doubts with Gilligan’s “I have yet to see…” comment. But he said it, so I quoted it! As for your examples of violence in Mexico. I wonder if honor-shame are not at work right on the surface (as in a Muslim honor-killing, for example), but is layered below the various causes that you mentioned. Behind the confrontations for power that you mention, is there a desire for respect, appearing macho, being the revered figure, being the controlling patron able to honorably provide? Violence is “pandemic” – as is litigation under the nation’s laws against defamation. Not all, but a huge percentage of violence and litigation is about saving face (preventing shame). The civil laws against defamation make no distinction between statements that are objectively true or false: if a statement or claim is damaging to one’s reputation or finances then it IS defamation. Are the statements objectively true? Makes no difference – it is illegal. Try to fit that into a rule of law culture! One person has suggested that this particular Honor/Shame culture has become focused solely on the Shame, leading to this state of affairs, and has dropped any consideration of the virtue of Honor, which some other Asian cultures retain. Here, since honor now carries negligible influence, the focus is almost entirely on preventing public shame. I.e., it is a defensive posture – a highly litigious society – but for different reasons than the very litigious U.S. Seems very peculiar, and I do not see the leaders being able to stop this train, or re-direct it to a constructive end. It really does seem only heart by heart it can be changed. Lastly, thanks for these posts! You’re doing a valuable service. @JLynnB Thanks for the insightful explanation here. I have heard people posit that some honor-shame cultures are more about the honor while others more about the shame, this your observation fits in that way. Though I obviously don’t know your context…I wonder if honor is not absent, but defined as “face.” Honor and face are surely related, yet some have distinguished between “face-cultures” and “honor-cultures.” Just some ideas. But regardless, you end the conversation on the right tone–how can this be redirected for social good? How can honor and shame be transformed? That is a vital question! And lastly, thanks for the encouraging word!